It’s a sunshine day! 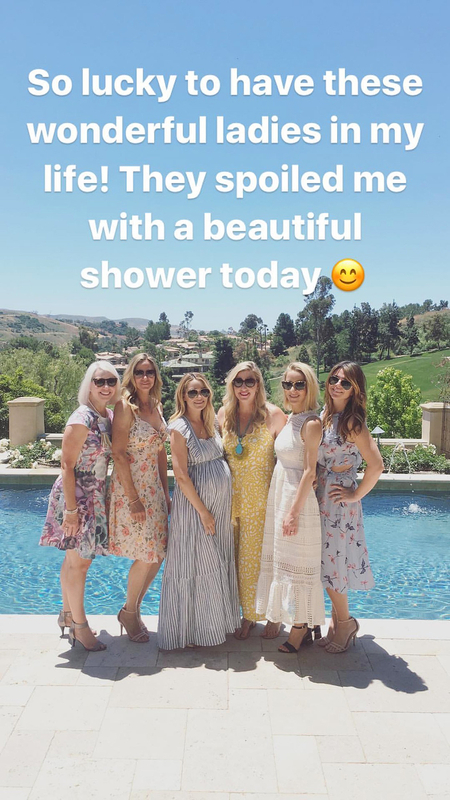 Lauren Conrad, who is pregnant with her first child, celebrated her baby shower on Saturday, May 20. The Hills alum, 31, took to her Instagram Story to share a photo from the sunny celebration. “So lucky to have these wonderful ladies in my life! They spoiled me with a beautiful shower today,” she captioned a shot of herself and a group of girlfriends posing outside in front of a pool. Conrad appeared to be in great spirits and looked gorgeous in a blue-and-white striped sundress, which hugged her growing baby bump. She also posted a photo of a beautiful cake topped with white flowers and blackberries. The Paper Crown designer announced her first pregnancy on January 1. “Happy New Year! I have a feeling 2017 is going to be the best year yet,” she captioned a sonogram picture on Instagram at the time. Conrad married musician William Tell in September 2014.